This delicate dessert is perfect at any time of year. To prepare the truffles, line a tin with cling film and then with baking parchment. Add the butter and cream to a saucepan and allow to come to a rapid boil. In a separate bowl break the chocolate into pieces, then add the boiling cream and butter. Whisk rapidly until the chocolate has fully melted into the cream. Add the egg yolks, orange zest and stir to combine. Pour into the tin and allow to cool, then use a teaspoon to break the chocolate into walnut size pieces. Roll into balls and coat in the coconut and nuts. Refrigerate until required. Combine the cocoa powder and icing sugar. Roll the puff pastry with sugared cocoa powder until it’s 1 to 2mm thin. Place the puff pastry to set in the fridge, then cut into two large rectangles. Line two baking trays with parchment paper and lay the pastry rectangles on each tray. Add an extra sheet of baking parchment. Bake for 6 minutes in the hot oven. Bring the milk and cream for the filling to the boil in a saucepan. In a bowl, whisk the egg yolks and sugar until pale. Pour the boiling milk over the mixture, then put the liquid on the heat, stirring constantly until it’s just set or coats the back of a spoon. Remove from the heat, add the chocolate and stir until combined. Cool for 1 hour or more in the fridge, then fold in the whipped cream. 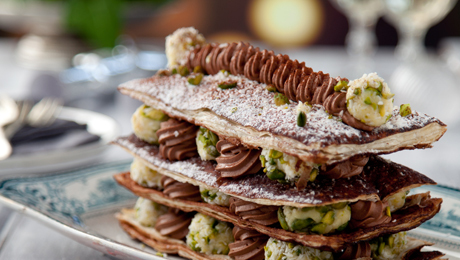 Build the millefeuille by placing a layer of the rectangular crisp on a platter. Pipe on the chocolate cream and add a few chocolate truffles, then repeat.